Innovative music for listening and dancing, by a great contra dance band. Traditional Scottish fiddle but...On the edge of jazz. Ed Pearlman, fiddle, and Neil Pearlman, piano, a unique listening experience. Tightly interwoven, heartfelt, rhythmic. Appearances by Laura Scott (rhythms) and Lilly Pearlman (fiddle). Listening and dance music Ed Pearlman and Beth Murray (Robinson). With guests Ruthie Dornfeld on fiddle, Barbara Russell on harp & bass, pipe sgt Gary McGrath on drum, and Doug Scott, hammered dulcimer. Airs, strathspeys, reels, jigs, waltzes, tunes old and new. Expressive melodies of Scottish fiddling blend with jazz improvisation and harmony, funk bass lines and the rhythms of Latin America, in a new sound BBC Radio Scotland called "a wonderful concoction." A hybrid of Scottish and Cape Breton traditions as performed for over 30 years by fiddler Ed Pearlman , with jazz and Latin music influences from pianist Neil Pearlman – an expression of America, crossroads of cultures. This duo draws on traditional folk melodies from around the world as a foundation for an eclectic set of structured improvisations and arrangements. 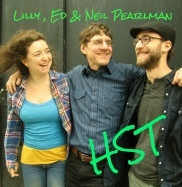 Neil and Dylan are each established musicians in the jazz and folk music scene..
HST has toured the US and Scotland with its unique double fiddle and piano sound. A tight and original sound with exuberant spirit, including trad and new tunes. This 5-track CD is $10 and features three trio and two duo numbers.